Before you dash off in a rush to book the first wedding venue you can get for August 25th 2017 (for example), consider who you are as a couple and the vibe you really want to establish at your wedding. Intimacy? Formality? Do you want a traditional affair honoring the backgrounds you both come from or do you want something fresh, authentic and informal to declare how your loves starts something new? It is possible to have a romantic, elegant wedding in a backyard or a friend’s home (many celebrities-and non-celebrities - have!). Your amazing reception location does not necessarily have to be an island resort or stately home. But you do have practical considerations to sort out before your idyllic dream turns into a nightmare. One of the main things to bear in mind is how far your ceremony location will be from your reception location or are they going to be one and the same? If there is a distance, is there ample parking at your reception location or will it be best to arrange a shuttle bus for your guests? Often, guests who have travelled a long way also arrange to stay over at the reception location if it is a hotel but if your location is more remote, they may also have to arrange transport and accommodation for themselves. 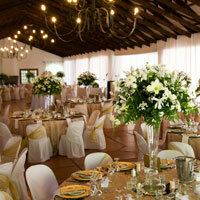 Do consider the logistics your guests - who do want to be with you on your wedding day- will have to put in place. Nobody wants a secretly resentful or travel-weary, stressed guest at their wedding - especially if you know you are the reason for it! The majority of wedding photos are taken outside in parks, beautiful landscapes, stately grounds, gardens, pastures, orchards and rustic settings. These are usually the grounds of the reception location so research the weather and time of year and the state of the landscape. If there is a lot of grass or soft ground, your high-heeled guests will be sinking and your photos will not represent you all in true wedding splendor. Do you need to provide high heel protectors to prevent this? Or is there a gravel path or some firmer ground you could use for the photos - with grass in the background? If you do choose an outdoor location, remember to provide for your guests against the elements. If the sun will be overwhelming, provide some shade or canopies. If there’s a possibility of rain, wind or festivities will last into the night, provide cover and outdoor heaters, maybe some shawls or umbrellas. Outdoor locations can be awesome, magical, whimsical and bring folk together in a festival mood; they can also be utterly miserable, for both you and your guests, if the weather and landscape are not considered. Mother Nature does not sign any contractual agreement! Obviously, you want a location that represents you both as a couple, that is not quixotic but does capture the magic of your romance and story. Just because you have always wanted to get married on a beach or a castle does not mean it is the most practical consideration if you also want your disabled grandfather to be present or a lot of your friends have young families. Only you can decide what is more important - your dream or who witnesses your wedding. These are priorities only you both can decide. It is possible for you to have both but it will require planning and thought. Consider the size of the venue and whether it will accommodate all your guests, that it’s not too labyrinthine so no one sees the critical moments of the wedding or announcements. There should be enough space for guests to eat, drink, talk, dance and move around freely. Ensure your entertainment or DJ has enough space for the equipment and performance. Any large catering trailers or vans need to be able to gain access to the grounds too. If you are using a park or public grounds, remember you may have non-guests in your photos and in your day. This may or may not be an issue - but it will be a fact. Check out your reception location venue in the daytime and at night. It may look romantic and gothic at 7pm but then like a neglected, dusty old folks’ home with a leaky roof at 1pm. Is there an adequate power supply for the entertainment and catering? Is the lighting sufficient? What are the acoustics like? If the banquet hall is too echoey, that will be a problem for the speeches and the entertainment. Tile or wooden floors can cause reverb, thick carpets muffle sound - neither are good. Does the venue include liability insurance, restroom provision and handicap accessibility? If not, can you if it’s required? All these small details need to be looked at before you can truly say your perfect reception location is perfect - whether it be a yacht, beach, Italian castle, a meadow in Mammoth, a swish hotel or a friend’s backgarden. Make your own contract up and stick to it.